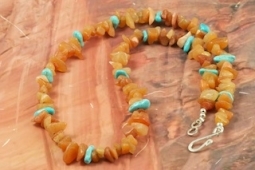 Genuine Turquoise and Carnelian Necklace. Sterling Silver Beads and Clasp. Created by Santo Domingo Artist Carol Pacheco. The Santo Domingo Pueblo is in New Mexico, near Santa Fe.